At the London Aquatics Centre we have three pools for use by the general public, clubs and professionals; for hire as an event space or for filming opportunities. The Competition pool is the largest at 50m long and 3m deep, set out into ten lanes for competitions and general fitness swimming sessions. Our Training pool is also 50m, however with it’s movable boom, it can be split into two 25m pools and the movable floor set at a much shallower depth, depending on the session taking place; it’s appropriate for swimmers of all levels. Our Diving pool is a 25m space with a moveable floor, which can be set anywhere between ground level and 5m deep. Each of our pools is guarded by certified life guards, maintained at the highest standard of cleanliness, and accessible directly from the changing rooms. As well as offering a public swimming timetable our range of community-tailored swimming sessions, programmes and lessons can be booked alongside varying membership options covering all of our pools. Learn more about swimming options here. 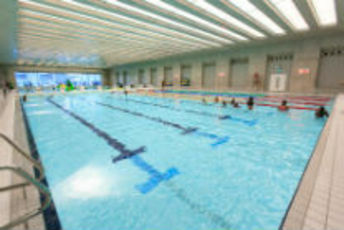 The former Olympic Competition pool is open for public lane swimming, private hire and competitions. 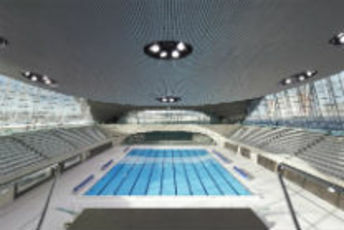 The training pool at the London Aquatics Centre is a unique pool that hosts lots of swimming sessions for all levels and abilities. 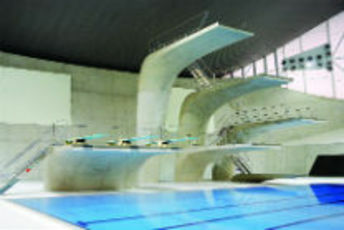 The Diving pool at the London Aquatics Centre has seven spring boards and five diving platforms.